By Allison Owen This week has been a hard one me -- as well as my friends -- and although it doesn't relate much to drum corps, I'd like to share something that is sad yet had a major impact on my life and my community. If anyone has ever suffered the loss of a very close (and young) friend then they know how we are feeling right now. My very good friend Whitney Broome, whom I mentioned in my article about friendships a few weeks ago, passed away after she was in a car accident on the way to school on Tuesday, Feb. 10. Many tears have been shed this past week over the death of this 17-year-old junior. She impacted more lives than anyone realized and she will be greatly missed by everyone she knew. Due to the heartbreaking circumstances of this week, I'd just like to take some time to let everyone know how I met Whitney and how great of a friend she was to me. Our high school band is a very tight-knit group of students and staff. This loss in our "family" has been tragic and is bringing us even closer together. When I first joined the marching band in ninth grade I would always see this girl (one grade above me) who played trumpet dancing in the stands to our "cowbell song." She would greet everyone with a "What up dawg?" and everyone loved her. I thought that Whitney was one of the coolest people ever and never in my wildest dreams thought that I would become good friends with her. As my freshman year came to an end I had somehow become good friends with some of Whitney's friends. When it came time for this school year to start, I found myself in two classes with Whitney and we became better and better friends. We live near each other, so if I was ever in need of a ride, she would take me home, even if she had something else to do. 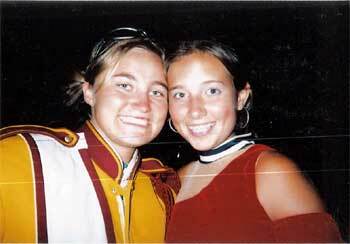 Whit had played trumpet since the sixth grade, and even though she would never admit it, she thought it was really cool that I was in drum corps. She would always make fun of me and my love for corps, but I knew it was all in fun. I enjoyed her relentless teasing because I knew (without words) that she was proud of me for living my dream. When I was cut from Spirit back in November, Whitney comforted me and tried to make me feel better; she hated to see anyone -- whether she knew them well or not -- upset. She had text-messaged me while I was at camp to see how I was doing and checked in on me to make sure I got home OK. Despite how much of a "nerd" she thought I was, she had planned on possibly coming to see a show this summer just to see what this whole "drum corps thing" was really about. Whitney was a very giving person. This coming weekend I am going to be in Nashville for the WGI color guard regional where I'll be working at the Memphis Sound booth. She knew how important it was to me, so she was thinking about coming with me so my mom wouldn't have to take off work to drive me down there and back again. Even if she decided not to go, it was the thought behind it that count. One of the hardest things I've ever had to do was carry her uniform out of school on Wednesday and know that she will never wear it again. I haven't told my story of Whitney to make anyone sad or want to feel sympathy for all of us. I know that this story barely relates to drum corps, but she means a lot to me and I just wanted everyone to know what a great person Whitney was and how big of an impact she had on so many people. If there is one thing I've learned from all of this, it is to let people know if they mean a lot to me. We aren't guaranteed tomorrow; so if someone has had an impact on my life, I'm no longer going to wait for the right time to tell them, because that time may never come. Thanks to everyone who knew of this tragic occurrence and has been thinking of us and keeping us in your thoughts and prayers. Keep praying for Whitney's family because this is a hard time for them. Although we will never be the same, Whitney's playful smile, as well as her loving spirit, will live on in our hearts forever. If you are going to be in Smyrna this weekend for the WGI guard regional, feel free to stop by the Memphis booth and say hello. I shouldn't be hard to find and I'd love to talk to anyone.